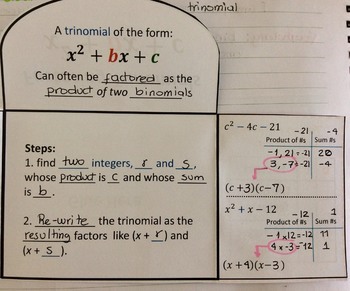 This resource can be used as an introduction for your students to learn how to factor a trinomial of the form ^++. 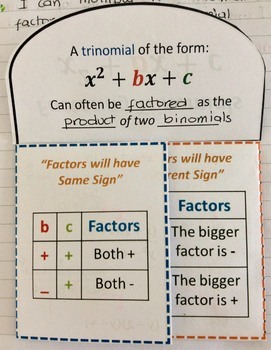 This foldable has an easy guide for your students to understand when the signs of the two binomials will be the same (both positive, both negative) or when they will have different sign. 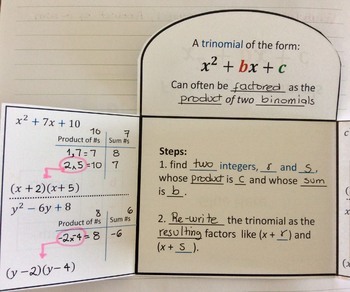 Considering the 4 cases for when a and b are positive or negative with examples for each one. Please take a look of the attached pictures. It works great as an addition for your INB. I appreciate your feedback! and remember that TPT gives you feedback credits that you can use in future purchases. If you like the quality of my work and you want to be first to know about promotions in my store, freebies and new products keep your wish list ready! and become my follower! This purchase is for one teacher only. 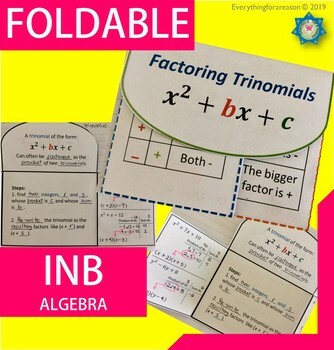 This resource is not to be shared with colleagues or used by an entire grade level, school, or district without purchasing the proper number of licenses. This resource may not be uploaded to the internet in any form, including classroom/personal websites or network drives.